4 Bedroom End of Terrace House For Sale in Rotherham for Guide Price £200,000. 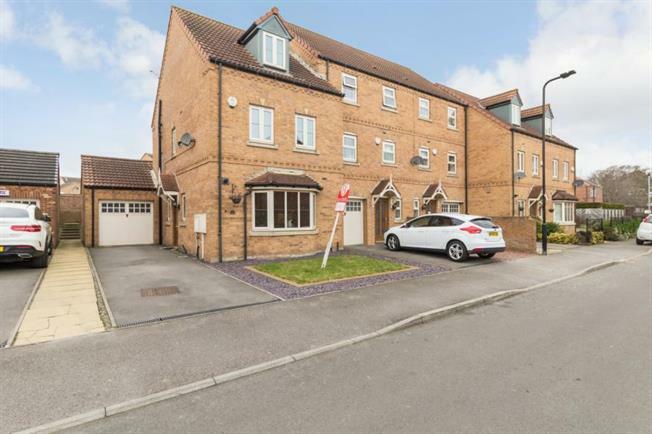 Situated on this sought after development, constructed by Ben Bailey Homes is this superb family home. The four bedroom end townhouse has accommodation over three floors and must be viewed to appreciate. The property gives access to local amenities, local schools and commuter links including the M1 and M18 motorway networks. In brief the property comprises of side entrance hall with stairs to first floor landing. W.C. Bay windowed dining kitchen having an extensive range of fitted wall and base units in Beech effect including integrated appliances. Rear facing lounge with feature fire surround and French doors to rear garden. First floor landing three bedrooms, bedroom two having fitted wardrobes and family bathroom with a white three piece suite. Second floor landing having master bedroom with fitted wardrobes and draw unit. En suite shower room with white three piece suite. Outside to the front of the property is a lawn garden with drive to the side giving access to the single garage. To the rear is an enclosed garden with patio and raised lawn.